Infinity Engineering Consultants, LLC celebrates its 15th anniversary today, March 4! In 2004, friends and partners Bill Thomassie and Raoul Chauvin started a little homegrown engineering firm in a small office on Canal Street. Since then, the company has grown. So much so that they purchased their first office building in the Fat City neighborhood of Metairie. The new office was built in 1965 and was one of the first buildings in Fat City. It has 7,700 SF of office space with room to grow with another 8,750 SF of warehouse space ready to build out. Needless to say, this is a big step in the life of Infinity and its employees. Here’s to many more years of growth and success! 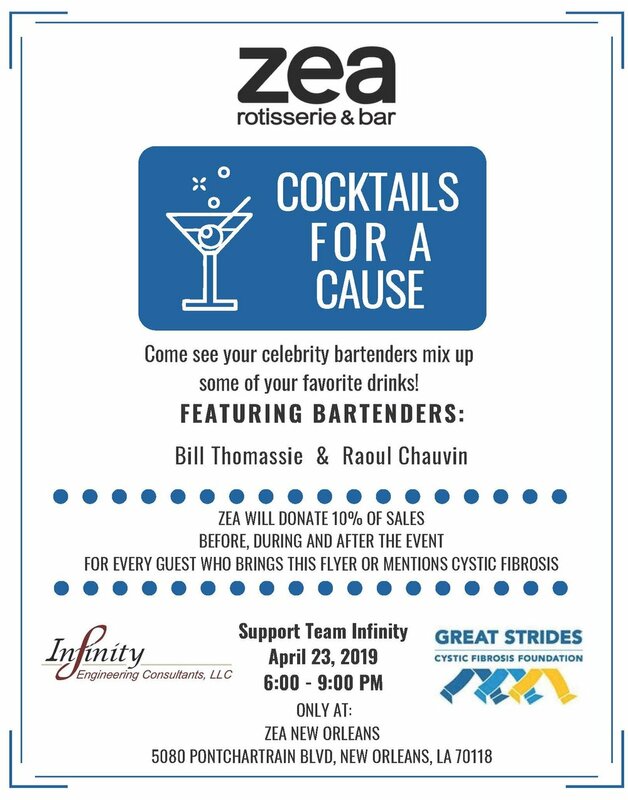 Last Wednesday, Bill Thomassie and Raoul Chauvin showed off their bartending skills at Infinity's "Cocktails for a Cause" fundraising event at Mizado in Metairie. The event raised funds for the ALS Association with a raffle, including passes to the Ogden Museum, Saints tickets, NOLA Motorsports passes, a 50/50 raffle, and a dinner and a movie gift bag. Additionally, 10% of the bar tab went toward the fundraising, bringing the total raised to $495! Many thanks to Michael Lietzinger and Rachel Kenney for their help organizing this wonderful evening. Don't forget to join us this Saturday for the New Orleans Walk for ALS. Walk check-in starts at Audubon Park at 8 AM, and the walk starts at 9! Click here if you'd like to sign up or make a donation. Yet another milestone Regional Transit Authority project hit the tracks this weekend. 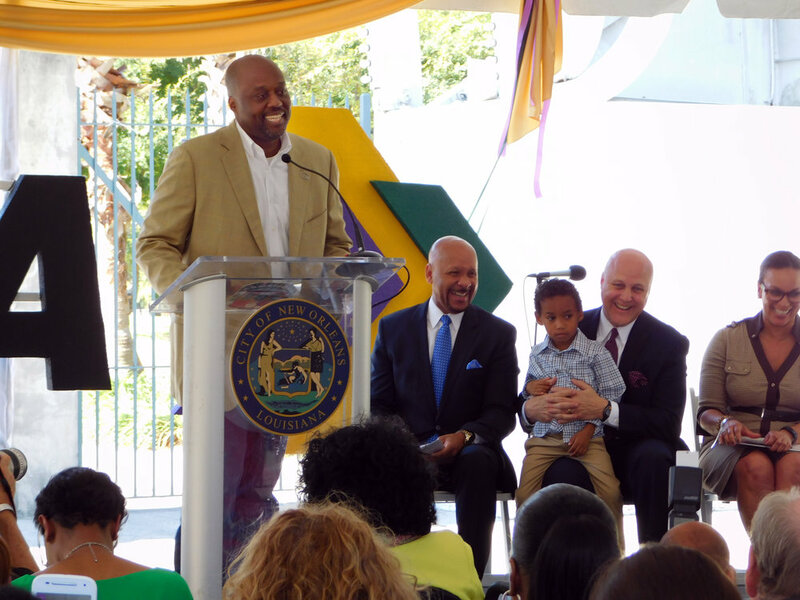 Today, the RTA and the City of New Orleans gathered at the entrance of Louis Armstrong Park on Rampart Street to celebrate the opening of the Rampart Streetcar line. As a member of the engineering design team, Infinity was responsible for the utility conflict resolution design for the 1.6 mile rail extension from Elysian Fields Avenue to Canal Street along Rampart. Come join us at Cocktails for a Cause! Infinity has formed a team for the 2016 Walk to Defeat ALS. What better way to kick off our fundraising than in true New Orleans style? Come on by Mizado and have a drink served by two celebrity bartenders, our very own Raoul Chauvin and Bill Thomassie! Principals Raoul Chauvin, left, and Bill Thomassie have a long lasting friendship and partnership that makes Infinity a great company to work with and work for. In 1985, two good friends graduated from Archbishop Shaw High School and went on to separate universities to pursue their educations in engineering, one in mechanical and the other in civil. Little did those young men know that 31 years later they would be celebrating their 12th year in business together. In 2004, Bill Thomassie and Raoul Chauvin joined their friendship and engineering experience to create Infinity Engineering Consultants, LLC. Together they have crafted a reputation for solid engineering design, dependability and client care. Over the years they have created a unique and nurturing work environment for their employees, which in turn shows through in the work delivered by the staff of Infinity. Here's to many more years of friendship and partnership!! City of New Orleans Mayor Mitch Landrieu announces plans to renovate the Canal Street Ferry Terminal during a press conference in Woldenberg Park Nov. 5, 2015. 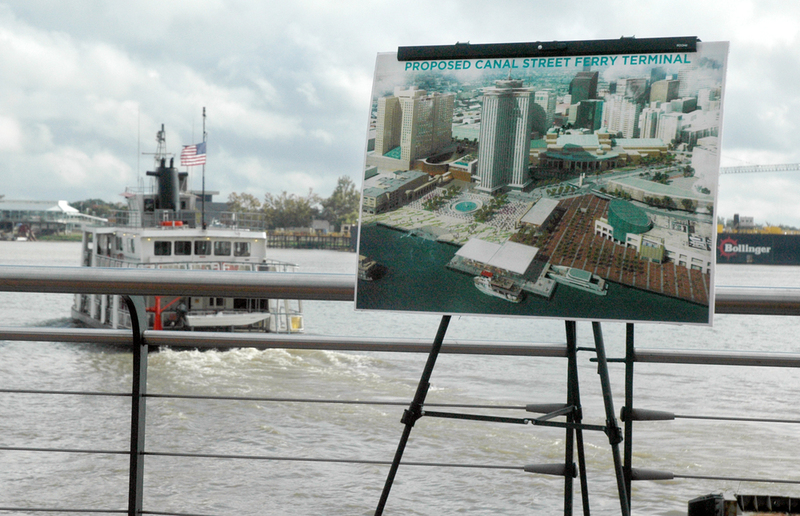 Assistant Secretary of Transportation Policy Carlos Monje, Jr. congratulates the Regional Transit Authority and the City of New Orleans in their efforts to obtain the Department of Transportation's TIGER grant to fund the new Canal Street Ferry Terminal. Mayor Mitch Landrieu talks about the plans for the new Canal Street Ferry Terminal as he walks with District "A" Councilmember Susan Guidry and Infinity Engineering Principal Raoul V. Chauvin, III. The proposed new Canal Street Ferry Terminal project will include a double ferry dock, new ferry terminal, streetcar access to the convention center, bus bay access and an expanded RTA bus fleet. RTA CEO Justin Augustine, center, greets Infinity Engineering Principal Partners Bill Thomassie, left, and Raoul Chauvin after the press conference announcing the new Canal Street Ferry Terminal. Infinity Engineering Consultants principal partners and city officials gather in front of the old Canal Street Ferry Terminal after the announcement of the plans of a new terminal. 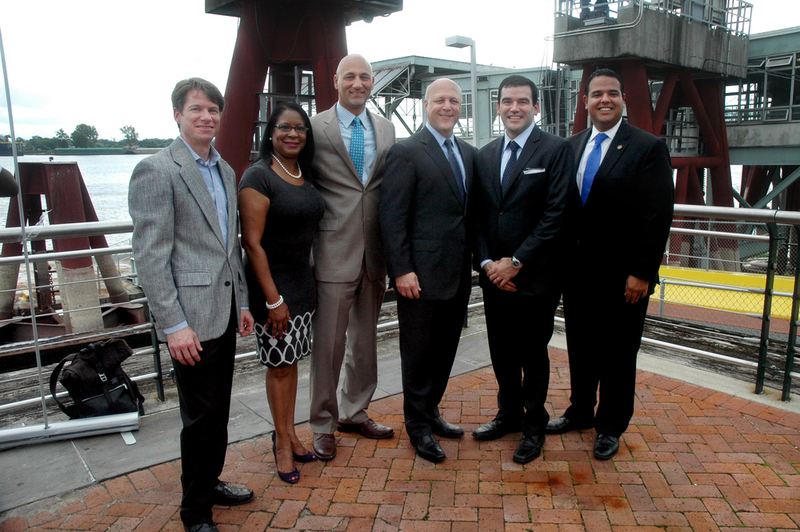 From left, Infinity Principal Bill Thomassie; District "C" Councilmember Nadine Ramsey; Infinity Principal Raoul V. Chauvin, III; City of New Orleans Mayor Mitch Landrieu; Assistant Secretary of Transportation Policy Carlos Monje Jr.; and District "B" Councilmember Jared Brossett. City of New Orleans officials held a press conference at Woldenberg Park on Nov. 5 to officially announce the plans to revamp the Canal Street Ferry Terminal using a $10 million grant. Infinity Engineering Consultants has the honor of being a major part of the design team that will be tasked with creating a new terminal, streetcar access to the convention center, a double ferry dock capacity and bus bay access. Funds for the project were procured by the Regional Transit Authority (RTA) through the competitive Transportation Investment Generating Economic Recovery (TIGER) grant. The City sees the renovations of the ferry terminal as a key piece of the puzzle in revamping the riverfront area. The new renovations will facilitate the revitalization of the area in advance of the City of New Orleans' 300th anniversary in 2018. Infinity celebrated 11 years in operation this week! We also wanted to recognize Phan Nguyen and Tung N'Vietson for nine and seven years of service, respectively! 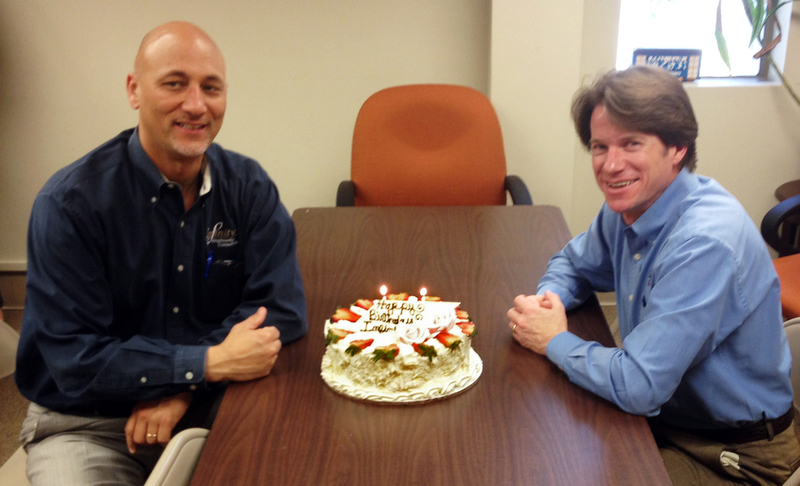 Principal Parnters Raoul Chauvin, left, and Bill Thomassie celebrate Infinity Engineering Consultants' 11th anniversary on March 4, 2015. Ms. Phan prepares pho for the entire Infinity staff to celebrate the company's 11th anniversary. 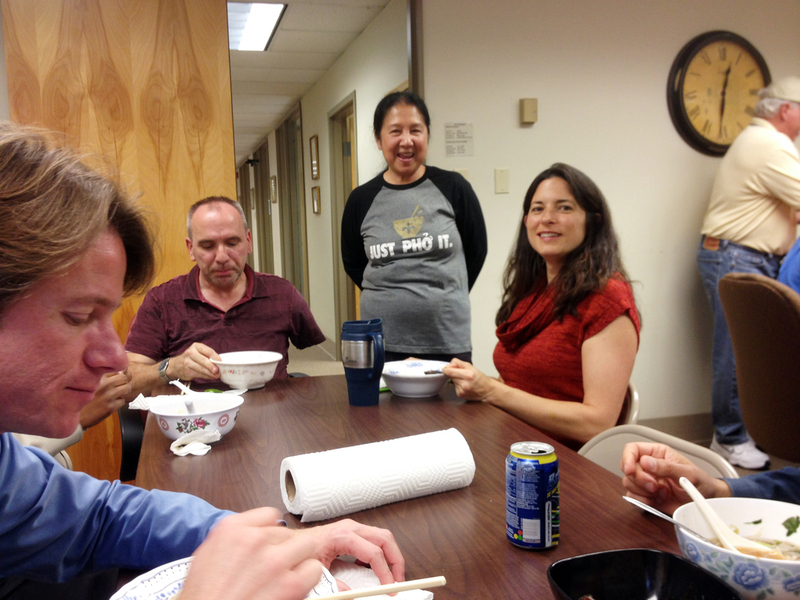 Infinity staff celebrate company and employee anniversaries with a pho lunch prepared by designer Phan Nguyen. From left, Bill Thomassie, Mike Laux, Phan Nguyen and Rachel Kenney. Eleven years ago this week, principal partners and long-time friends Bill Thomassie and Raoul Chauvin, opened the doors of Infinity Engineering Consultants, LLC. Over the last decade + 1 year, they have been providing excellent service in the engineering consulting industry to both the public and private sectors in Louisiana and beyond. They have grown Infinity from just a staff of themselves to 20+. Here's to another decade of growing, learning and providing excellent services!! 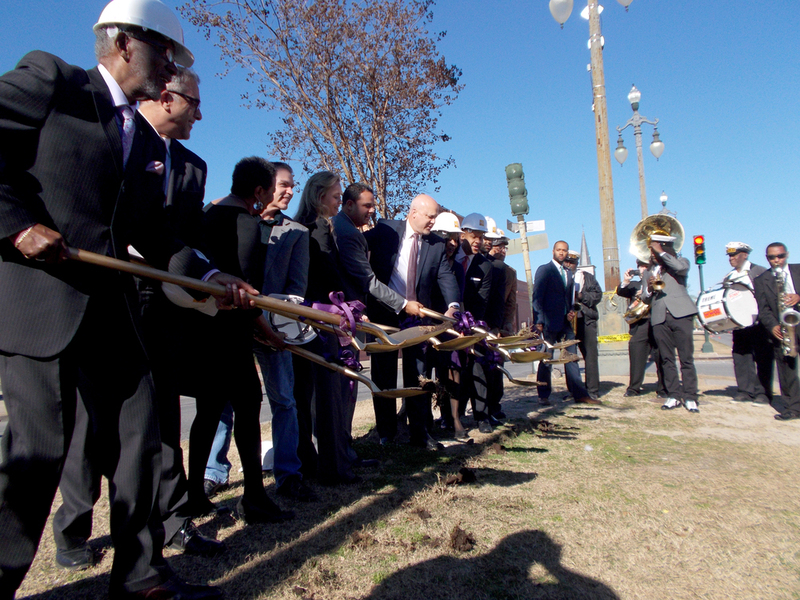 Local City and State officials break ground in a ceremony Wednesday, January 28, 2015, to commemorate the beginning of construction on the Rampart Streetcar Line. 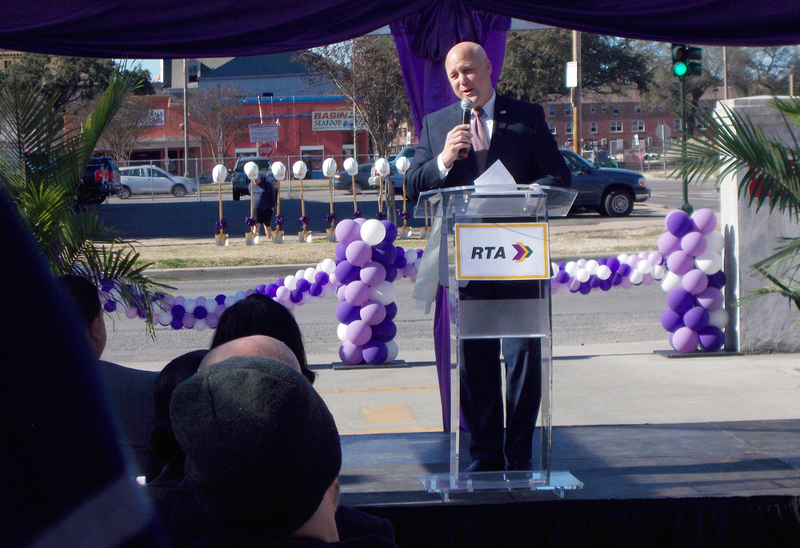 New Orleans Mayor Mitch Landrieu gives a speech at the ground breaking ceremony for the Regional Transit Authority's Rampart Streetcar Line Wednesday, January 28, 2015. Infinity Engineering Consultants' Principal Raoul V. Chauvin, III, left, and Civil Engineer Michael Riviere stand before the ceremonial shovel at the Rampart Streetcar Line ground breaking ceremony on January 28, 2015. 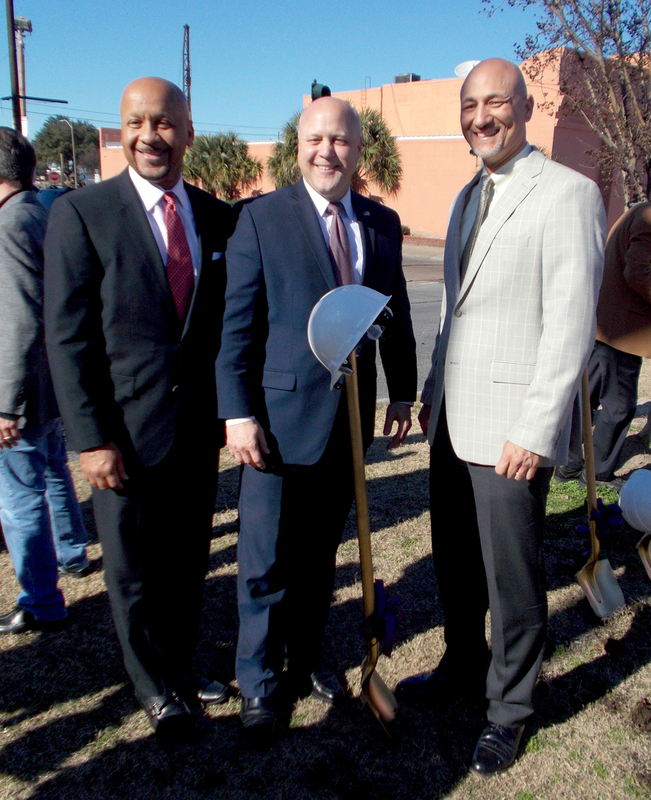 Regional Transit Authority CEO Justin Augustine, from left, New Orleans Mayor Mitch Landrieu, and Infinity Engineering Consultants, LLC Principal Raoul V. Chauvin, III celebrate the ground breaking of the Rampart Streetcar Line at the ceremony on January 28, 2015. The Tremé Brass Band leads a second line to the ground breaking ceremony for the Rampart Streetcar Line on january 28, 2015. Ceremonial shovels and hard hats line the neutral ground on Rampart Street for the ground breaking ceremony of the Rampart Streetcar Line expansion on January 28, 2015. A member of the Tremé Brass Band is silhouetted against the sun as the band plays at the Rampart Streetcar Line ground breaking ceremony on January 28, 2015. 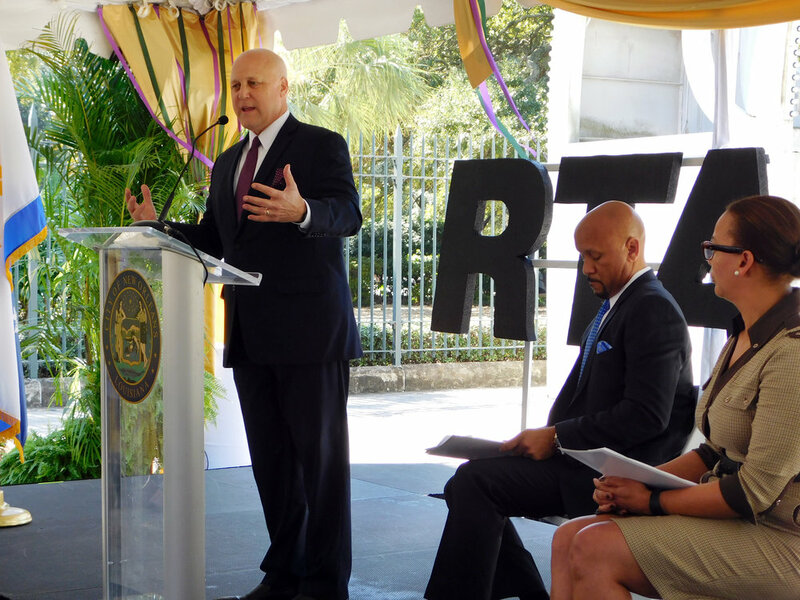 Wednesday afternoon ushered in yet another milestone for the New Orleans Regional Transit Authority (RTA) with the groundbreaking ceremony for the much anticipated Rampart Streetcar Line. The Tremé Brass Band set the mood as City and State officials spoke to a crowd of the advantages and possibilities the streetcar line will bring to the area. 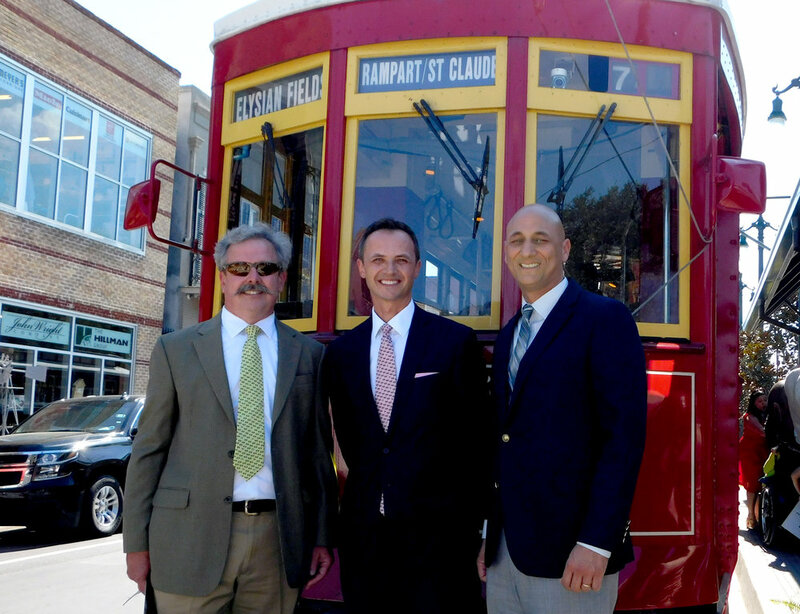 Infinity Engineering Consultants, LLC is proud to have been a part of the design team for the $41.5 million project that will bring a 1.6 mile streetcar line from Canal Street along Rampart Street and St. Claude Avenue to Elysian Fields Avenue. Our team was tasked with producing construction drawings, record specifications, and identification of utility conflict and design. The streetcar is expected to roll by September 2016. Infinity Principal Partners Bill Thomassie, left, and Raoul Chauvin, III, proudly accepted their third award as one of New Orleans' Best Places to Work. 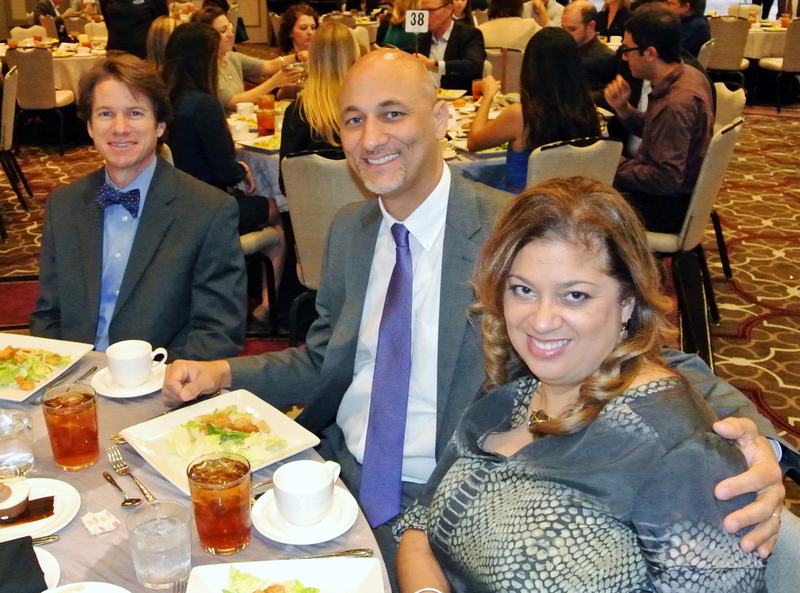 Infinity Engineering Consultants employees, from left, Michael Riviere, Rachel Kenney, Cindy Gallo, Amber Cardon, Raoul V. Chauvin, III, Bill Thomassie, Kevin Loze, Katie Carter and Vinay Ramesh attend the New Orleans City Business Best Places to Work awards banquet. From left, Cindy Gallo, Rachel Kenney, Amber Cardon, Dave Guttuso, Elvin Calderon, Michael Laux and Katie Carter. From left, Vinay Ramesh, Michael Riviere, Karson Kall and Bill Thomassie. From left, Bill Thomassie, Raoul Chauvin and Cindy Chauvin. 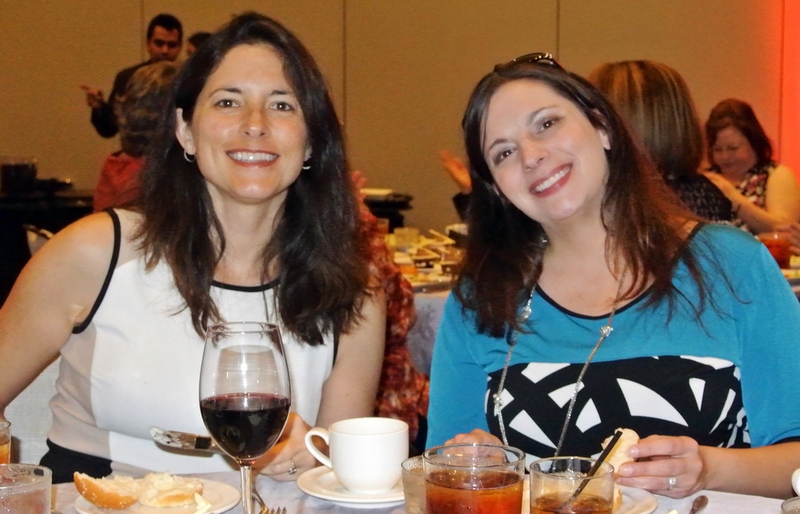 Rachel Kenney, left, and Amber Cardon. The Infinity Engineering Consultants team takes the stage to accept their award as one of New Orleans' Best Places to Work. 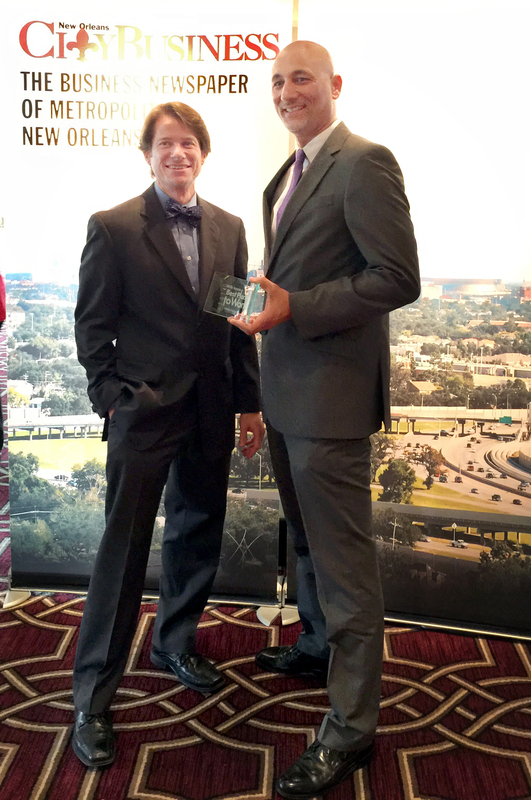 Infinity Engineering Consultants, LLC was honored once again by New Orleans City Business as one of New Orleans' Best Places to Work! This being our third year in a row to be selected, we salute our employees for making it so. Without great employees, we couldn't be a "Best Place to Work." We had a wonderful time at the awards banquet on December 5 and want to congratulate all of the other recipients of this nomination. The New Orleans City Business selects 50 businesses, 35 large and 15 small, every year "based on salary, benefits and other factors pertaining to employee morale." Here's to hoping we continue to create a fun and fulfilling work environment for many years to come! Infinity Race for the Cure team members, from left, Sushmeetha Annam, Vinay Ramesh and Mike Laux take part in the 5K walk on October 25. 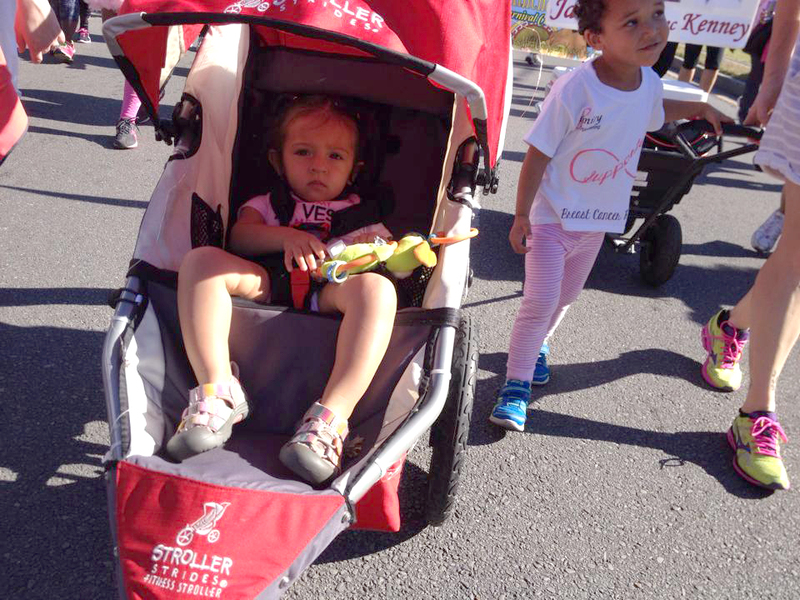 Olivia, left, and Desmond, children of Infinity Race for the Cure team members, take part in the 5K walk to raise awareness and funds for breast cancer. Infinity Race for the Cure team members take part in the 2014 5K. The Infinity Race for the Cure team walks together during the 2014 5K walk to raise awareness and funds for breast cancer. The Infinity Race for the Cure team. Back row, from left, are Vinay Ramesh, Sushmeetha Annam, Mike Laux, Katie Carter, Cindy Gallo, Jay Gallo, Rachel Kenney, Elvin Calderon and Elizabeth Calderon. Front row, from left, Desmond Carter, Olivia Kenney and Julie Frasier. The Infinity team took to the streets again this year for the New Orleans Komen Race for the Cure. The 5K raises awareness and, most importantly, funds for breast cancer research. The Susan G. Komen organization has invested more than $2.2 billion in the breast cancer movement since it began in 1982. The New Orleans Susan G. Komen Race for the Cure raises funds for local grants for education, screening and treatment programs. Since 1992, Komen has put $4.8 million in grants in New Orleans. Seventy-five percent of money raised in the New Orleans Race for the Cure stays here in our community. According to the Komen New Orleans website, this year alone (April 2014-March 2015) they have granted $616,000 to nine local projects that provide "breast health and breast cancer services to thousands of low-income and uninsured women in our community." The Race for the Cure is a great way to raise funds and awareness, but it doesn't have to stop there. To make a donation to Komen New Orleans, click here.